Composting is a great way to reduce the amount of food waste and yard debris from going to landfills, it provides a wonderful “free” amendment to poor soils, and can even reduce your water use and save you money. Most Americans produce a lot of household trash and waste a lot of food. What if I told you there’s a way to reduce both? Start by planning your meals to reduce the amount of food you accidentally compost in your fridge. You know what I’m talking about- that kale looked great at the farmer’s market and you seriously meant to incorporate it into your meal planning, but you got busy, and now it’s turning into brown mulch. That, my friend, is refrigerator composting. It wastes food and it wastes your money. For ideas on how to save money and plan your meals ahead, go here. Before you start cooking, set two bowls near your workspace. One bowl will be for food scraps that can easily be made into stocks or added to soups and another for foods that will go directly to your compost bin. Most fresh vegetable scraps can be saved for later use in stocks and soups, so don’t compost those. I like to keep a gallon sized freezer bag in my freezer for the ends of carrots and celery, onion peels and roots, and scallion tops and roots. I use that bag to season the chicken stock that I make from the leftover bones and trimming of previous chicken dinners. Another bag can hold the trimmings and leaves of other root vegetables like beets, turnips, parsnips, any extra carrots, celery, or onion trimmings you don’t need for your chicken stock bag, the stem ends of fresh green beans, pea pods, etc. That bag can be used for making vegetable stock. Be careful when adding strongly flavored vegetables like cabbage, Brussel sprouts, asparagus, and broccoli – too much of those vegetables can overpower the flavors of the other vegetables in your stock. Be sure to put these scraps in the freezer quickly as you would any other perishable food. The second bowl is for food scraps that can’t be repurposed into soup and stock. Examples include egg shells, coffee grounds (and the filter! ), bruised or insect-damaged portions of fruits and veggies not fit for consumption, etc. If you want something more decorative than a bowl or want to hold your scraps over for a few days without taking them to the compost pile, one of these “kitchen composters” might be the ticket. After your meal, you can scrape your plate into the compost bowl/bin, too. If you are running short on time, you can also freeze your scraps and even use egg cartons as compostable container for your frozen scraps. Although it’s possible to compost meat products, including bone, there are some stricter guidelines that need to be followed. We’ll get into that later in the article. A word of caution about compost bowls: any open container, like a bowl, should be emptied soon after finishing your meal. Scraps, especially cooked scraps, tend to draw pests like ants, fruit flies, cockroaches, and rodents. Keep it sanitary by keeping it clean. Many of the “kitchen composters” listed in the link above come with a tight-fitting lid and some have a filter that fits in the lid to reduce odor. They don’t actually compost your scraps, though, so you should still empty them into your compost pile or bin. The real composting requires more than those receptacles can do. Don’t forget that you can regrow some of your food scraps. Check out this video to find out which vegetables can be regrown. 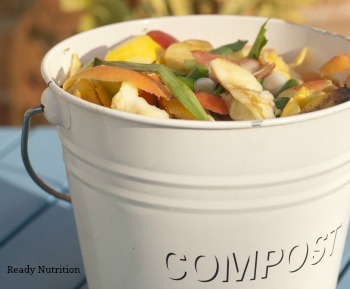 If you grow your own food, composting is a must! 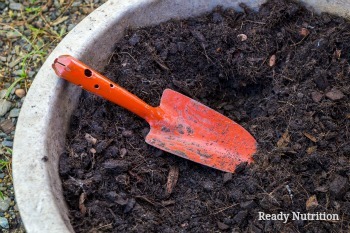 Any healthy trimmings or waste can be added to your compost pile. The compost produced will replenish the nutrients in the soil, reduce water use, and provide a healthy environment for next year’s garden. If you’d like to learn more about the relationship between plants, the soil, and the microbes that live there, I’d recommend watching Symphony of the Soil. Grass clippings and diseased trimmings from your garden can be problematic for compost bins. Grass clippings are high in moisture and can change the ph balance of your compost, especially if you are going to be adding high-moisture content kitchen scraps. A better practice is to allow the grass clippings to compost in place right on top of your lawn in a process known as mulching. 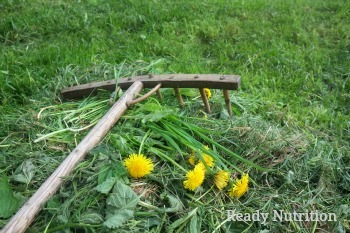 Reel mowers are the best choice if you intend to mulch the clippings. You can find American made reel mowers here. 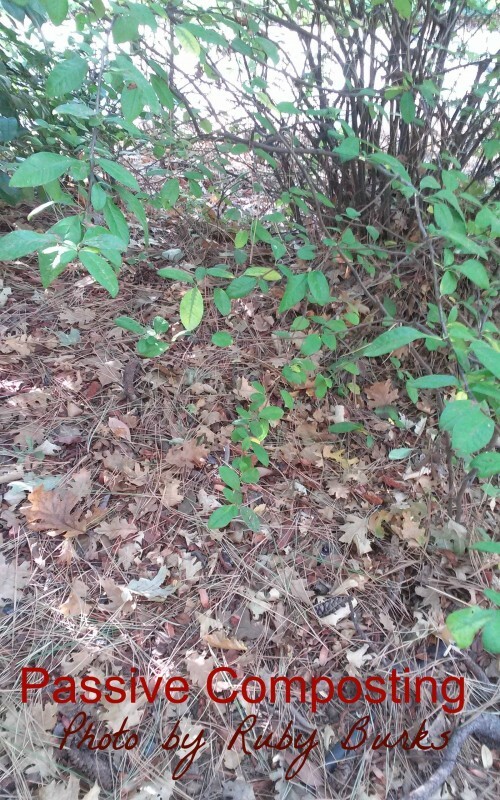 Diseased clippings and plants may survive the composting process, so careful consideration should be given before adding them to your compost pile. The same is also true of some weed seeds, tubers, corms, and rhizomes. Compost piles can reach 130-140 degrees Fahrenheit, but problem additions need to be exposed to those temperatures for 72 hours (three days) and all the problem material needs to be exposed to those temperatures. When in doubt, either don’t add it or create a separate quarantine compost pile. Meat and bones present their own problems. Although meat and bones will decompose and turn into compost, it attracts vermin and other wildlife (like predators) much more often than plant-based composting material. Flies are attracted to the decaying meat and you may find maggots in your compost pile. If you’re new to composting, stick with plant-based materials for your compost pile until it’s well-established. There are several options to choose from when composting depending on your space, time, and physical abilities. All of them require a balance of materials to compost correctly and efficiently. 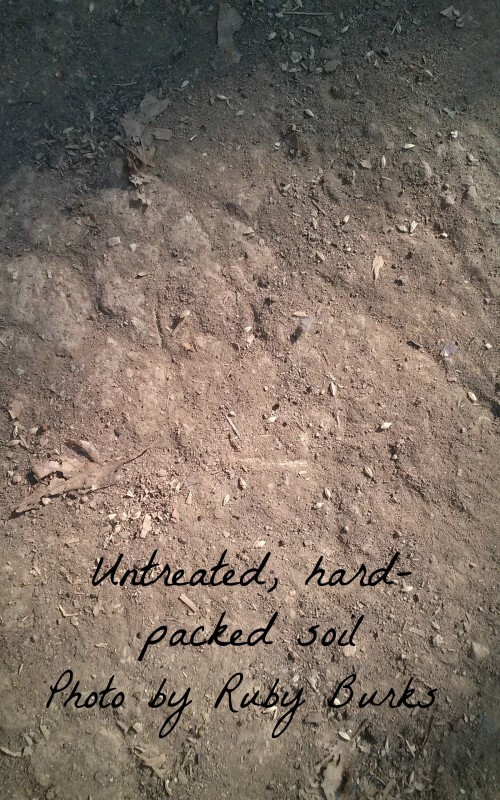 Ideally, composting should recreate the conditions found in nature for the natural decay process. To achieve that, four components are needed: organic waste (kitchen waste, leaves, woody material, paper in small amounts, etc), soil (to provide microorganisms), water (60% is optimal for microorganisms to break down the material), and air (for oxygen). In order to create a hospital environment for your hardworking microorganisms, it’s important to have the correct nutrient balance or carbon to nitrogen ratio (C:N). Think of it as browns and greens. Browns would be things like dead, dried leaves, small wood chips, twigs, etc (carbons). Greens could be fresh trimmings from your garden or kitchen scraps (high in nitrogen and moisture). The optimal ratio to start a compost pile is 30:1. For example, a recipe using 1 part leaves and 1 part food waste by volume would achieve close to a 30:1 ratio. Moisture content is important to the microorganisms and the other hard-working insects that will inhabit your healthy compost pile. For instance, did you know that sow bugs (aka pill bugs, woodlouse, roly-poly) are actually crustaceans? However, moisture content above 70% can create an anaerobic environment and increase the chances of the compost pile developing a foul odor. It also slows down the composting action since composting relies on living organisms to happen and nothing will live without air. The best way to test your compost pile is to squeeze a handful of it. It shouldn’t drip water or be too dry and crumbly and instead should clump together in a soft, non-dripping ball in your hand. The structure of the compost pile can range from “piling” (also known as passive composting) which is quite literally just making a pile of organic matter and letting nature take its course, to constructing containers or bins to hold the compost in place. Piling takes the longest to decompose and the pile of organic matter should always get a top dressing of finished compost or soil to inoculate it with microorganisms. Bins, three-sided structures, can be made from wire mesh or wooden frames. Welded wire and reclaimed pallets are a popular choice for building material. Drum or “tumbler” composters are an excellent choice for those who have a difficult time lifted a heavily loaded shovel or rake due to mobility issues. There are also many ideas on the Internet to build your own tumbler composter out of material you might have on hand. We’re getting ready for winter and have recently spread our finished compost out in an area with poor soil. In the first picture, you can see how hard and packed the native soil here is in the Sierras (known as decomposed granite). 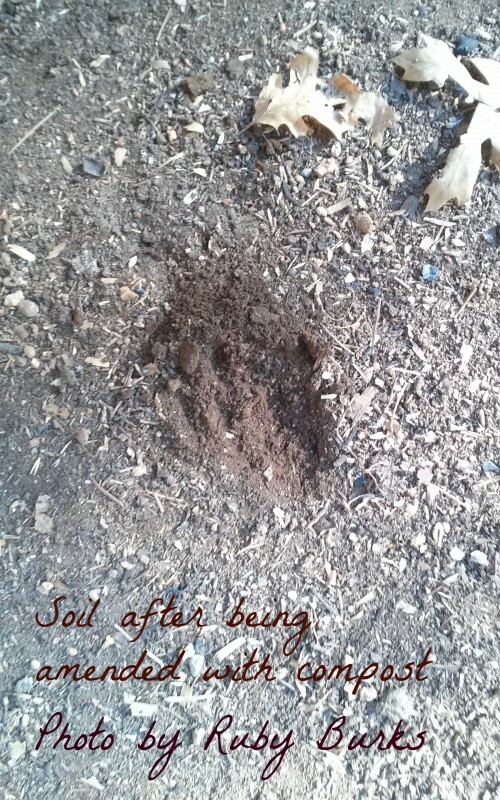 In this photo, we’ve spread our finished compost and incorporated it into the hard dirt. Notice how much more moisture the compost-amended soil holds compared to the natural, unimproved soil. They were both watered at the same time, but the compost enriched soil is still moist. Our perennial landscaping is mulched with a new dressing of fallen leaves for winter. This will compost in place (piling or passive composting) and provide a deep mulch layer for our bushes and trees. This is especially important now with the severe drought in California. We haven’t watered our bushes and trees in over two years, yet they’re showing no signs of drought stress. Composting is a great way to reduce the amount of food waste and yard debris from going to landfills, it provides a wonderful “free” amendment to poor soils, and can even reduce your water use and save you money. With all the different methods, it’s easy to find one that fits within the space you have available and the time you have to commit to it. Up next, we’ll talk about one of my favorite composting methods- vermicomposting. Stay tuned!